I used to love Cinnabon. Really, I still do. I just can’t afford them anymore. Financially or physically. For a playoff Sunday of football, I figured I could make an exception. At least on the physical part. These are exactly like the real thing – and a dozen don’t cost anywhere CLOSE to $30. Best served warm from the oven, but if you zap them in the microwave a few seconds they are practically good as new. I actually had to “borrow” a photo from allrecipes.com because when I brought these to my sister’s house, they were gone in about 12 seconds. I didn’t get a chance to take a picture – so sorry for the stretched version here. Someone there (who shall remain anonymous) – actually grabbed the baking dish from me as I was heading to rinse it off and proceeded to eat all the extra filling/frosting that has leaked out. I’m actually a little jealous I didn’t think to do that myself. The frosting especially. I wanted to eat it with a spoon. The filling is delicious too. Every other cinnamon bun recipe I’ve seen uses white sugar in the filling. The brown gives it a caramelly richness that’s fabulous. The other really cool thing about this recipe is that you can prepare it the night before. I’m not such a fan of waking up at the crack of dawn to make a yeast dough that has to rise for an hour and a half before I can start making breakfast. Just put these in the fridge after placing the rolled buns in the pan. Then in the morning, put them in a cold oven – turn it on to 350° and allow to cook for 25-30 minutes. I popped mine in, went and took a shower and by the time I was dressed and mostly ready, my house was filled with the fragrance of sweat bread and cinnamon. Perfect. After the dough has doubled in size turn it out onto a lightly floured surface, cover and let rest for 10 minutes. In a small bowl, combine brown sugar, butter and cinnamon. Roll dough into a 16×21 inch rectangle. Spread dough with sugar/butter/cinnamon mixture. Roll up dough starting along the short side and cut into 12 rolls. Place rolls in a lightly greased 9×13 inch baking pan. Cover and let rise until nearly doubled, about 30 minutes. Meanwhile, preheat oven to 400 degrees F (200 degrees C). Bake rolls in preheated oven until golden brown, about 15 minutes. While rolls are baking, beat together cream cheese, 1/4 cup butter, confectioners’ sugar, vanilla extract and salt. As soon as rolls come out of the oven, place them on a plate upside down. Spread any filling that has seeped out over the top and then spread frosting on rolls before serving. *Dissolve the yeast in the warm milk in a large bowl. Mix in the sugar, margarine, salt, and eggs. Add flour and mix well. Knead the dough into a large ball, using your hands dusted lightly with flour. Put in a bowl, cover and let rise in a warm place about 1 hour, or until doubled in size. Proceed from step 2 above. I love that you can prep these before the time – perfect and oh so yummy. I’m going to make these. I wondered what kind of cinnamon you used, since there are different types. Saigon, Canela Molida, ceylon, tung hing etc. 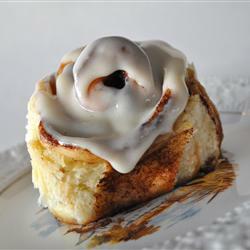 I always thought that the actual Cinnabon roll was a stronger cinnamon flavor. I do look forward to making these. Thanks! I use saigon cinnamon. Enjoy these, they are absolutely delicious.